Close your eyes for just a moment and imagine yourself gently rocking in the waters of a high mountain lake. A breeze blows your hair every so slightly, and the sound of water lapping the sides of your little boat splashes just loud enough to hear. You are resting right now, but your feet are resting comfortably on the pedals, waiting to glide you back across the lake to the dock. But you are not ready to go yet, and so you sit, paddle boat swaying beneath you, completely content with the world. Designed not for long trips but relaxing afternoons, paddle boats provide an element of satisfaction otherwise absent from water settings. They allow for a unique style of transportation different from canoe or kayak in their easy of access and stress-free nature. Other crafts require balance, coordination, or careful attention. 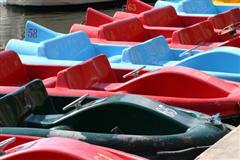 The paddle boat requires only a driver, willing to sit and press lazily on pedals to get from one dock to the next. There are few things that cannot be done more simply on a paddle boat than on other water vessels. Rather than towing and undocking a pontoon to fish from, a process which introduces unnecessary stress and worry to an otherwise peaceful and calming experience, one can fish from a paddle boat with far less trouble. Likewise, instead of venturing out to explore the shallow and remote coves of a lake in a tipsy, unsettling kayak, the paddle boat allows maneuverability while maintaining a certain level of stability. Perhaps best of all, rowing with the feet rather than hands, arms and shoulders releases the body from what may otherwise be a physically trying experience. Even the rowboat, which is similar in many ways to the paddle boat in design and application, falls short in its reliance on exhausting oars. To sit and row the smallest boat for an hour around a lake can be painful, distracting the enthusiast from the natural beauty of the setting. When using one’s feet, however, the body stays fresh and alert, while the posture required by a pedal boat encourages the head to stay up and the eyes to take in all the scene has to offer. There are few things in life that provide the relaxation and calm brought about by a relaxing ride in a tiny boat, and this is precisely the topic of this website. It is a place to celebrate virtues of the paddle boat; to enjoy all that comes along with cruising through the water in a lightweight, maneuverable craft without wearing oneself out. It is a place to reflect on the fish and beavers, the trees and flowers, the people – everything that makes paddle boating such a unique and fulfilling pastime. Here we recognize that to experience life without a paddle boat is to remove a part of the experience; to change our relationship with nature and the wider world. 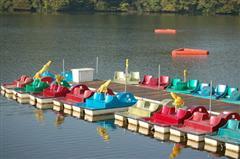 Look around and reflect on your own water adventures as we appreciate the contributions paddle boats make in our lives.